I never believed I suffered from seasonal affective disorder, but after more than a month of unusually gloomy and rainy weather, I’ve forgotten what a sunny day looks like. The rain even followed me to Texas last week when I traveled to visit family. At this rate, I’ll soon begin to mildew. 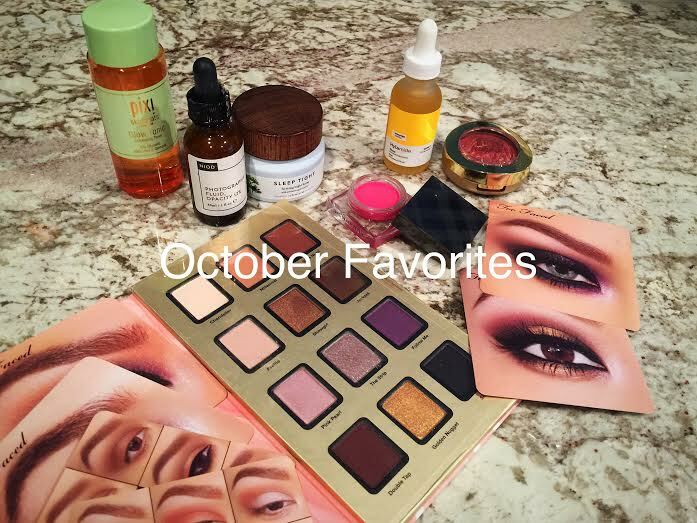 But never mind: Let’s get to the makeup products that brought sunshine to my life in October, as well as a couple that were clouds in my coffee. I have many eyeshadow palettes, but the one I reached for most in October was the Too Face Star Dust Palette, a collaboration with Instagram sensation Vegas Nay. The shades are extremely wearable and combine for a multitude of different looks. Even better, the palette comes with photos and step-by-step instructions that give beginners a head start. The limited edition Star Dust palette is available only at Ulta. After washing my face, I always use an acid toner followed by a refreshing spritz toner. The beauty world was always abuzz about Pixi Glow Tonic, but I could never get my mitts on it (it’s sold at Target and the shelf was always bare). I finally broke down and ordered it directly from Pixi Beauty and, wow, I’m glad I did. It exfoliates, firms, tightens and smells lovely too. Niod Photography Fluid is another cult product I decided to try after reading the reviews. It’s a pale yellow liquid that, when applied before makeup, promises to make users’ skin look better in photographs. It works best for me when I blend a small amount into my foundation instead of applying the two separately. The improvement to photos isn’t insanely dramatic, but there is a small difference. In my view, any improvement helps. I’m a blush junkie. It’s one of the last products I apply during my makeup routine and makes a huge difference to the final results. As I age, I find that creme blushes are often smart choices because they put moisture back into the skin. Right now, I’m loving Burberry’s Lip & Cheek Bloom in Hydrangea. It provides a lovely sweep of glowing color on the cheeks. I’m a big fan of masks in general, and an even bigger fan during the cold weather months. Lately, I’ve been into sleeping masks — the kind you apply just before bed and wear until morning. One of my favorites is Sleep Tight Firming Night Balm by Farmacy. It’s a little greasy, so I don’t use my best pillowcase on mask night, but the results are worth it. And, besides, what’s better than sleeping your way to better skin? It got great reviews for imparting a subtle, gradual glow — and I’m all for the JLo glow — but it was an “Oh, no!” for me. I’m talking about Hylamide Glow Radiance Booster, which purports to target dullness,uneven tone and dark spots. Unfortunately, It also leaves behind a sticky residue and sweet scent I just can’t bear. Any glow I might have attained wasn’t worth attracting fruit flies. I already owned two Milani blushes — Luminoso is one of my favorites — so I thought I’d add another to my drawer. Red Vino looks gorgeous in the pan. It’s a deep cranberry shot through with veins of gold. Unfortunately, none of the glow transferred to my cheeks. It just looked flat, blotchy and blah.